Here I am, blogging from the dark side of the moon, the CLO lounge at the embassy. 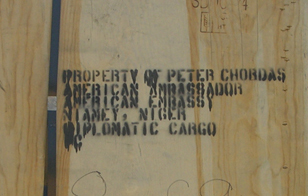 Peter has to accompany a medivac, boo-hoo, to France. He will leave tonight and come back Friday. He said, I won't have time to shop. I say, there's more in the Paris airport shops than there is in the entire country of Niger. He says he has a lot to do before he goes tonight at midnight, I said, "Like what, making a list of everything you're going to buy me?" Peter is going somewhere cold and dark and wet and will have to wear a (borrowed) coat and a scarf. No fair! It simply doesn't feel like Christmas here, it's hot in the daytime, sunny every single day and gets dark at the same time as when we arrived in July. In Portland it's hailing! I love hail, I always open the big heavy front door at 6225 Reed College Place and watch the hail with the Cast. I'm like a displaced east-coaster in California. Here, it's the same day, everyday, over and over again, like the movie Ground Hog Day. I did find our Christmas ornaments today though, in one of our last boxes to be unpacked. We went to the Grand Hotel for brochettes on Saturday and I told Peter I was surprised they didn't have a big tree up. Yeah, right. Me, who hates all that holiday overkill: complaining. I miss the Christmas graphics at Target. How's that for pathetic? And this year they had things designed by Tord Boontje, that fabulous Dutch artist! I should be talking about the Christmas tree at Rockefeller Center or something, not Target. 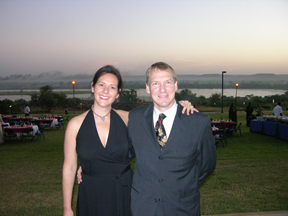 If anyone can remember this far back, we were married 19 years ago today. Is that all? Tell me about a Christmas detail in your town in the comments. We have experienced one of the greatest luxuries! Leopold cooks for us 1.5 days a week. Prior to his arrival, we have been planning all meals and grocery shopping, which is incredibly time consumering, since many things cannot be found in the stores and even in the very best situations, we have to go to more than one to find all the ingredients. This has been especially trying for Dina since she has to arrange for a duty driver to pick her up and drive her around. Leopold is originally from Togo. He has cooked for a high-ranking French embassy employee in the past. A Canadian meteorologist then hired him until he left and our neighbors who moved in to that house didn't need him full time so we decided to try him and see if we wanted to share his services. His first day with us, he made baked fish in a herb cream sauce, served with a salad in which he cut the carrots and cucumbers into flower shapes and concocted a tangy mustard vinegrette dressing. Both were delicious! For dessert, he made homemade chocolate ice cream. Tell me you wouldn't want him to cook for you! He also made three pizzas and chicken enchiladas, plus a fruit salad with melon, pineapple, and grapefruit. He also shopped for all the ingredients and bought extra fruit and vegetables, milk, and eggs for us to last the week. Last night, we had a soupy beef stew with vegetables and garbanzo beans to pour over couscous. He also made delicious Capitan (fish) brochettes in a salty lime marinade served with homemade french fries and salad. Anorexics beware! The other important point to make is that he's nice. All of our hired help are. The way he smiles when we talk about food. The dishes he describes that he'd like to make. His suggestions and ideas for meals and presentation really show his artistry. There are other cooks here. We are fortunate in that we found a great one. Wow, thanks for checking back in after I've been sitting over here in the dark for so long. Needless to say we are looking for a new internet service provider, but that will take as long as everything else does here. Reminder: 34th least developed country in the world. We got our stuff! Some of it anyway. After not seeing or hearing about our household effects for FOUR months, Friday I came home, after picking up kids from school, and there was a flatbed truck containing two containers! We have six more to come! We happily unpacked laundry detergent and art supplies and books and our very own dishes and waaaaaaay too many shoes, all of which will be ruined by the sand here, or will fall into comas in the closet, to emerge in two years unworn and out of style. Unpacking our stuff I had the weirdest reaction: homesickness for Portland. While we are just camping in the house it didn't seem like we really moved here, having cookbooks from the Reed College Place kitchen and paintings show up seems so radical: a misplacement, a "These don't go here," feeling. Meanwhile, it's almost Thanksgiving and we are wearing flip-flops everyday. The kids say the water in the pool is getting cold. The swim instructor said no one really takes lessons until February, when it starts warming up. Babies wear woolen hats now. Today's high: a chilly 95 degrees. We hit a major obstacle with our internet at home. As you know, we had spurratic connection most of the time. Then for four days, we had awsome internet use. There must have been a stalled satellite overhead! Then, as if someone pulled the plug (and we believe someone did), NOTHING! Dina called our local mafia and they reported that THEY had a problem. They came out a few days later and told us we couldn't use our router. Appearently, we were sucking up all the available broad band so they cut us off. We have a different router which the guy has spent several days (2 hours at a time when he came) trying to set it up. Bottom line; we're looking for another service provider. While we were out, work has been busier than a bee hive. I think the flu season is upon us. I keep forgetting that it's winter here at the 13th parallel where it's 87 degrees out. Just as the Veteran's Day long weekend was about to start, I got called in regarding a bus accident about 5 hours out of Niamey. It was an archeological expedition with Americans and Italians on board. I was able to make phone contact at the crash site and help a paramedic with the tour triag patients. Only two were more seriously injured and I was able to locate a good hospital run by Missionaries in Galmi about 100 kilometers back from where they came. The following day, I made radio contact and spoke with the attending physician. Both patients were stable and very lucky. I researched air transport for them but they declined and made their own arrangements to come by ground transportation. I wiped my hands clean at that point. Last Tuesday, I was invited by the Ambassador to travel with her to Dosso (about 1 1/2 hours from Niamey) to assess the healthcare of the natives. The military is setting up some training there and they already had their medical unit set up. They had 3 doctors, several medics, and 2 nurses. They offered to see the local Africans there and I was invited to help. Over 1000 people showed up. I saw a lot of malaria, infections, and malnutrition. One woman came in with her 8 children. Those beautiful little mushroom kids were all sick with Malaria and mom is expecting twins. I also saw a woman with HIV. The team saw over 400 patients that first day. Camille is loving her horseback riding lessons. She just glows when she's out at the stables. Stefan plays in a sandbox there under the bird nest tree and runs around more than most of the horses there. It's a healthy playground for the kids and we are lucky to be able to belong to the Equestrian center. Anywhere else, I'm sure we could not afford it. Our weekend is about to start. No doubt there will be more to report on Monday. My internet connection at home has been out for a full week now, have you noticed? Saturday we went to Camille's equestian center and watched a "spectacle" a student jumping competiton. They barbequed brochettes, as they call them here, and we sat outside and watched the show and the sunset, drinks in hand: colonial life style in place. 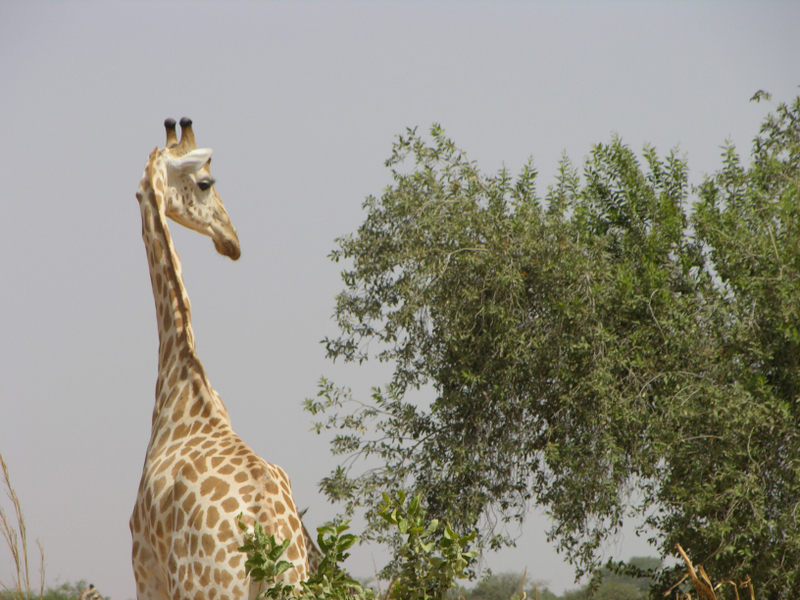 Yesterday we drove out in a group five cars, or Land Cruisers, I should say, to see the last herd of wild giraffes in West Africa. There use to be 3000 of them, then there was 100. Now there are in the 300 range. So things are looking up, but not too up. We drove out of Niamey about an hour, then picked up three guides who sit on TOP of your car and tap a stick on the side of the car to let you know in which direction to go. We had seen some people at the equestrian competition the night before who had been out last week, they said it only took about 20 minutes to find the giraffes. I'd never heard of anyone not finding any giraffes. But after almost two hours of searching, I thought we might be the first. And we had the Ambassador with our group, so we hoped we didn't have the intern guide. Obviously, the giraffes had not gotten our email (mine is down too, as you know) about showing up within maybe, two hours of us driving around looking for them and the one non-Land Cruiser getting stuck in the sand and not finding anything, except villages in the middle of the millet harvest. Finally one of the guides pointed excitedly with his stick, then pumped fists in the air. 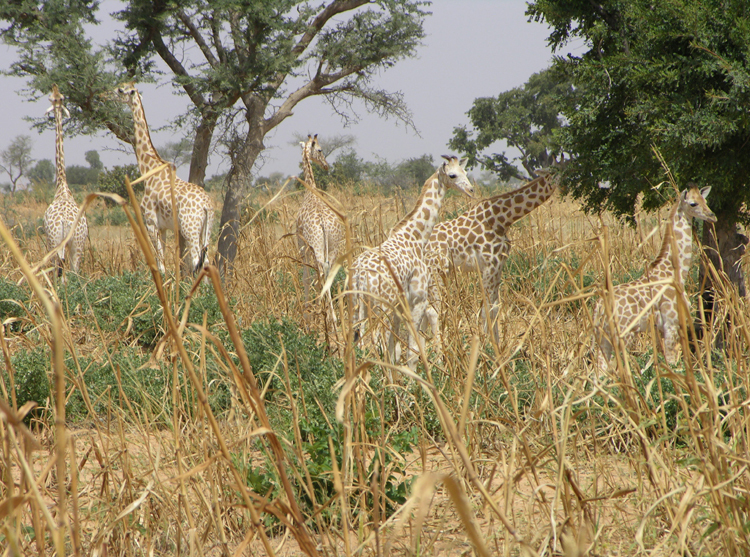 Off we went over grass and through sandy ruts and there was a group of ten giraffes, including three or four babies. I loved seeing them eat from the Acacia trees and wander around on their own terms. The babies were skittish, but otherwise, you could get pretty close. They blend into the landscape so well I can't believe we ever found them. The marines that work at the embassies are chosen from the top 1% of their class, and the training program to work at an embassy has a 70% attrition rate. The guys who let us through the door into the embassy are literally the few and we are so proud of them, especially since most of them are young enough to be our children. I hate that. 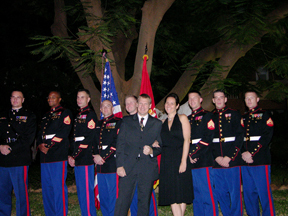 Thanks U.S. Marines and especially the Marine Security Guards Embassy Niamey for a great party. Ouaga was very very interesting and had many different contrasts to Niamey. It is more "city," more developed, and more western in terms of shops and restaurants and clothing attire. The health care standards are higher with newer clinics and greater application of modern resources. I felt I had accomplished a lot for just a 5 day visit. I had seen quite a number of patients, visited multiple clinics including a radiology center, two clinics which provide full services including basic surgeries (I observed part of a hip replacement), and an AIDS infirmary that not only gives care to patients and their families but also is working on an experimental HIV vaccine. I had also met with many of the Embassy community as well as the local health community. I gave a 30 minute lecture "Health and Well Being." 53 embassy employees attended. On Friday night after we had eaten out at a fine restaurant, I awoke in the night and vomited. I was assuming the worst and wasn't going to be fooled by the instant relief and momentary good feeling one gets right after. But the blahs never returned. I guess I was just lucky. The following day we went to the artisan festival. It was hot but I mostly viewed the art work of venders inside air conditioned buildings. 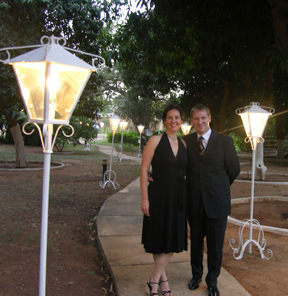 We had a very nice evening at the Ambassador's residence. Early the next morning I was half awake because of the booming music coming from the discoteque across the street when all of a sudden, "Bang!" I developed an acute onset of pain on my left lower side. Such a sensation I've never felt before. The usual medical possibilities ran through my brain; bad food or water, parasites, bladder infections, gunshot wounds, ovarian cysts (not likely)... The pain stayed localized and intense but no nausea or diarrhea. Unable to find a position of comfort or use the bathroom, I got up and paced. Dina heard me and I told her what was going on. We called Paulina, the embassy nurse, who came and took me to the clinic. I didn't have to tell her what tests to run, she skillfully took the initiative. All of my lab work was normal except for my urine which was concentrated and revealed 3+ blood. I drank lots of water and got a liter of IV fluid. The pain subsided and then went away. My suspicion is that I probably passed a miniscual kidney stone complicated by some dehydration. Now, a week later, I'm recovered (deep sigh). 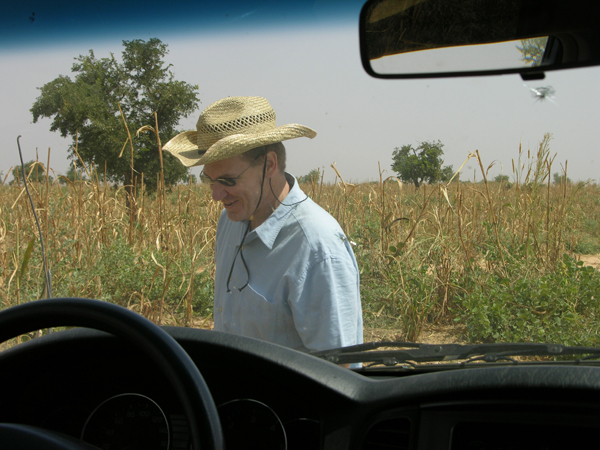 The drive home to Niamey was uneventful and I came back to a very busy week of work. 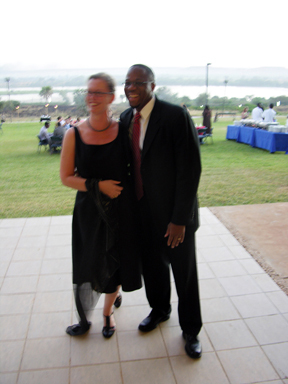 I had several meetings to attend and had to write several reports including a travel report on Ouaga. Too many phone calls. Most of the patients presented complicated issues including some psychosocial problems that can go way beyond my scope of practice. I'm not a therapist. "Don't go selling crazy here. I'm all booked up" says Jack Nickelson. I have some limitations but I'm always willing to listen and try to help. I spent a few hours, after work on Friday afternoon, catching up. Now it's Saturday morning. Stefan is playing with his cars, making all those engine noises. Camille is rubbing her sleepy eyes and Dina is waiting for the computer.